September is a weird month for me. It makes me hope the summer will go on a little longer, but at the same time it has me craving fall foods likes soups and stews. The cooler weather over the last couple of days made it a great time to make a soup. 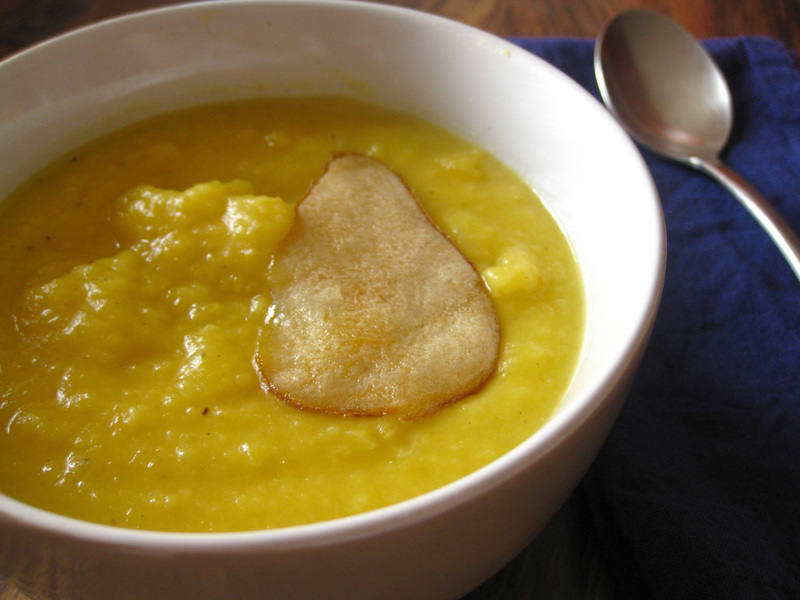 I still had a few pears so I decided to adapt Martha Stewarts Pear and Autumn Vegetable Soup, from the Oct 2006 issue. I loved the idea of adding pear to the vegetable soup, but I was a little surprised that Martha called for water instead of broth. I also thought the soup could use a little more flavour so I added some sautéed onion as well. The soup is wonderfully satisfying and warming on a cold rainy day. There are a lot of steps in the recipe so it’s a little time-consuming, although most of it is unattended. You can skip the pear garnish and replace with pumpkin seeds, but it does make the soup very pretty. You can also skip roasting the squash and just peel and dice the squash instead. Preheat oven to 200 degrees. Slice one pear very thinly, using a mandoline. Place slices on a parchment paper lined baking sheet and bake for 1 hour till slices are dry. Set aside. Heat oven to 400. Slice the butternut squash in half, scoop out the seeds. Drizzle with olive oil, and sprinkle with salt and pepper. Roast for 1 hour. Once done, scoop the squash out of the skin. Peel and core the remaining pears. Cut them into large chucks. In a soup pot, saute the onions until translucent. Add the pears, squash, and broth. Bring to a boil, season with sage, salt and pepper, then lower the temperature and simmer for 45 minutes. Let the soup cool a bit, then use and immersion blender to puree. Stir in the cream. Serve soup with sliced pears as garnish. I’ll be submitting this to Cream Puffs in Venice for Magazine Mondays. Check out what everyone else has been up to! Great combo of flavors…. totally agree about craving foods from the fall. Thanksgiving here we come!!! The earliest signs of autumn show up on bloggers recipes! Butternut and pears–sounds delicious. Nothing like autumn soups on a crips day. I agree with about September. I am pretty excited about the colder weather and the stews and soups. I love this recipe. I use apple a lot with squash, but why not pear? I love this. This recipe sounds delicious! I love butternut squash soup in the fall. We usually make it on one of those chilly September nights and then top it with gorgonzola crumbles. The cheese really pairs well with it. Can’t wait to try this recipe for something new! Cheese would have been great with this! Thanks for the idea! I used dried, but the original recipal called for fresh. I think dried worked well. Love the flavor combination on this recipe. Wonderful autumn soup. I’m holding on to summer and embracing fall. How scizoid is that? But the soup does both doesn’t it – as taste of both. This looks grand and I am a soup-o-holic! I’ve recently begun appreciating pears more…this sounds very interesting. Great idea. Pingback: Cream Puffs In Venice - Magazine Mondays: Ricotta! Sounds like a wonderful combination of flavors. Perfect for this time of year.